STAR LANKA _ TV Radio Sri Lanka , around the world _Entertainment Arts with FUN: Susan the star! 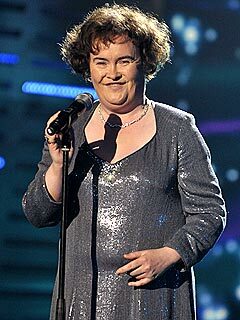 Susan Magdalane Boyle (born April 1, 1961) is a Scottish Grammy Award-nominated singer who came to international public attention when she appeared as a contestant on reality TV program Britain’s Got Talent in April 2009, singing “I Dreamed a Dream” from Les Miserables. Boyle was born in Blackburn, West Lothian, Scotland, to Patrick Boyle, a miner, World War II veteran and singer at the Bishop’s Blaize, and Bridget, a shorthand typist, who were both immigrants from County Donegal, Ireland. She was the youngest of four brothers and six sisters. Born when her mother was 47, Boyle was briefly deprived of oxygen during the difficult birth and was later diagnosed as having learning difficulties. Boyle says she was bullied as a child and was nicknamed “Susie Simple” at school. Harnessing her talent at an early age, Boyle first took singing lessons from voice coach Fred O’Neil. She attended Edinburgh Acting School and took part in the Edinburgh Fringe. Prior to Britain’s Got Talent, her main experience had come from singing in her local Catholic church, Our Lady of Lourdes; in local choirs; and in karaoke performances at pubs in and around her village. In August 2008, Boyle applied for an audition for the third series of Britain’s Got Talent and was accepted after a preliminary audition in Glasgow. Global interest in Boyle was triggered by the contrast between her powerful voice and her plain appearance on stage. The juxtaposition of the audience’s first impression of her, with the standing ovation she received during and after her performance, led to an international media and Internet response. Within nine days of the audition, videos of Boyle-from the show, various interviews and her 1999 rendition of “Cry Me a River” - had been watched over 100 million times. Her audition video has been viewed on the internet several hundred million times. Despite the sustained media interest she later finished in second place in the final of the show behind dance troupe Diversity. Boyle’s first album, I Dreamed a Dream, was released in November 2009 and became Amazon’s best-selling album in pre-sales. According to Billboard, “The arrival of “I Dreamed a Dream” marks the best opening week for a female artiste’s debut album since SoundScan began tracking sales in 1991.” In only six weeks of sales, it became the biggest selling album in the world for 2009, selling nine million copies. In September 2010, Boyle was officially recognised by Guinness World Records as having had the fastest selling debut album by a female artiste in the UK, the most successful first week sales of a debut album in the UK, and was also awarded the record for being the oldest person to reach number one with a debut album in the UK. On July 9, 2010, Boyle said that her second album would be a Christmas album entitled ‘The Gift’. As part of the lead up to the album, she will be holding a competition ‘Susan’s Search’, the winner of which would get to sing a duet with her on her new CD. The album was released on November 8, 2010. It has been announced that Boyle will appear in a musical about her life. She will appear as herself, rather than “having to sit watching people up there”, who are actors.